I was in class the other day, when one of the Clients asked me about modelling a Planter Box, "The corners have a radius, can I make a Revit Family for that?" Sure I say, but I worry about their skill level, as this is a Revit Fundamentals class. So I started thinking… I have been playing around with Global Parameters of late. I know that they have been in there since 2016 R2, but I hadn't explored it enough myself, then after reading blogs and having chit chats with fellow Revitarians, I realised that there is not much to it. Then digging a little deeper, I wondered, we can get Model-in Place Elements to update Parametrically? And that’s the Nerdy kinda cool that I like Model-In Place (MIP). My BIM Manager says to never create or use Model In-Place Elements. GENERAL SET-UP OF THE CLIENTS PLANTER BOX. Well, it's not my job to step on anybody's toes, but there are times when a Revit Family is an overkill for a Project. 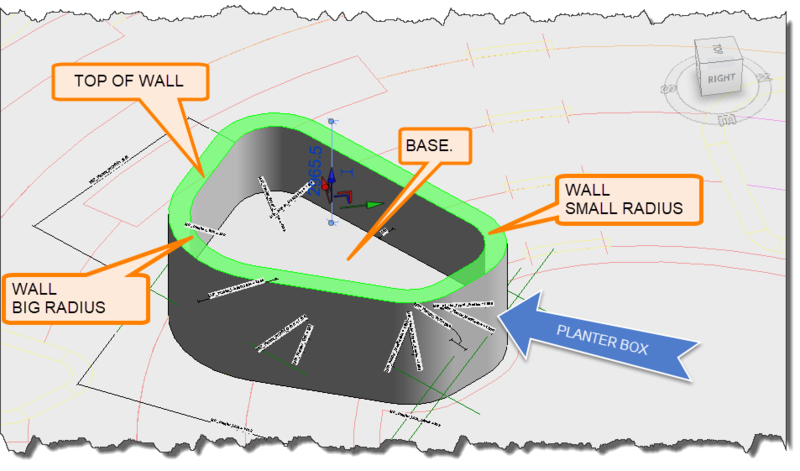 One time, I had to Model a Gravity Retaining Wall from a Surveyors .dwg file or for an example. Then there is a Client that has come to several Revit Classes where She Models Existing Buildings using Point Clouds as her reference and from time to time she needs to create 1 off ornate Windows. Or maybe you want to use In-Place Masses for very basic Conceptual Designs. They are a 1 off and unique to 1 project. The functionality that a Revit Family, .rfa file creates is not important to Modelling/Drawing Production. You are not being lazy and ignoring the fact that a Revit Family would serve you better in the long term. You can actually save an In-Place Family out of a Revit file, but we will get to that later. Starting a MIP from the start. Let's start at the start with creating an In-Place Family and there are plenty of Blogs, YouTubes and all that business out there, so I'm not going to show you what is only a Google away. I will focus on some of the Key aspects that I do when it comes to In-Place Models. Instead, go to your preferred Discipline Tab and use the Component Button with the Model-In Place option. Downstream Data into Excel, Navisworks, IFC etc. When you give it a name, use MIP as a Prefix so that everybody identifies the Model-In Place object much easier. Use Company Standard Naming Conventions or, create Company Standard Naming Conventions. Here are a few links to some MIP information that I have gleaned from Google. Need to check your MIP, Ideate have an idea! Just like Revit Family creation, we can use Dimensions to add Parametric functionality to the MIP. While in the Edit Extrusion mode of the MIP, add a Dimension, select it and Create new Label. Now be careful with your Parameter Naming Conventions because there is no-where to edit this Label, these are not like Shared, Project or Global Parameters. Once again I would use a MIP suffix to identify the Parameter to the MIP object. Testing the robustness or "Flexing" is not just editing Parameter numbers, you need to Edit Profile to see if the Parameters hold or break with an "Error cant be ignored." Getting Type Parameter workflows with Global Parameters. One of the issues with MIP is that if you copy several around then select them all to change a dimension/thickness, all the Parameter options disappear in the Project Browser, as if you have selected a Door and Mechanical Duct Family together. So how do we get these MIP objects to be more user-friendly? That’s right, Global Parameters, BANG! If you haven't used Global Parameters before, they are fairly easy and they are the icing on the cake as far as clever little workflows. Select your MIP Object and look at the Parameters in the Properties Dialog box, notice the little Squares on the right-hand side of the Parameter? Select and create a Global Parameter like you would a normal Parameter. Think of it as a Nested Family and having to relate a nested objects Parameter(s) into a Host Family. To find and further edit Global Parameters look inside the Management Tab and look out for the button next to the Project and Shared Parameter Buttons. Make sure that you add Global Parameters, THEN copy your MIP around, or you will need to edit each one individually. You know we need to look at AuntieDesk again. Paul F. Aubin once again is all over it. Where else can Global Parameters help? Report the SetDown of a Steel Column as a Reporting Parameter to update the SetDown of the Slab for the Steel Column. Setting the Constraints between grids. Making all distances equal and updated through 1 location. Formulas for Floor to Floor based on the two inputs above. There are many more, so start looking at Global Parameters and improve your Revit functionality.